The Mississippi River Sculpture Park in conjunction with Prairie du Chien Parks & Recreation Department invites you and your family to the 5th annual variety show. Fun filled acts that will thrill and amaze you from around the world. 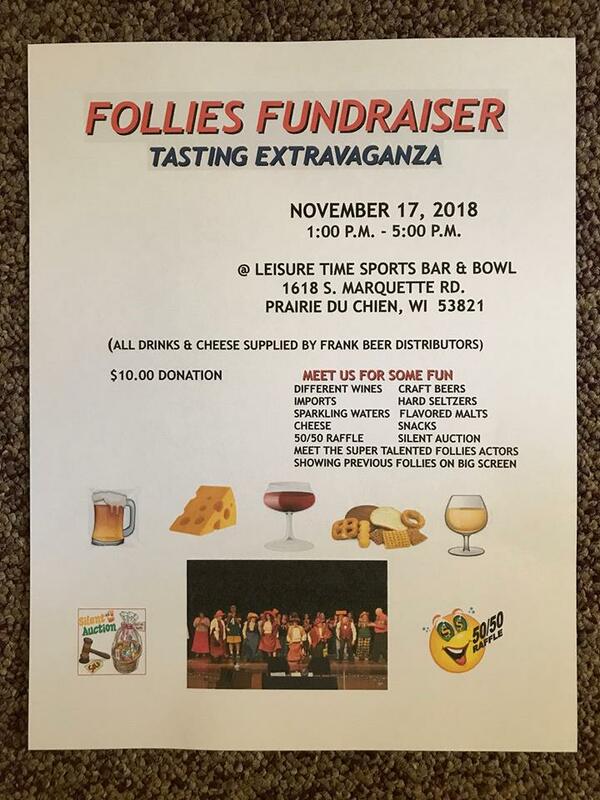 It will be offered as a door prize for the Follies. 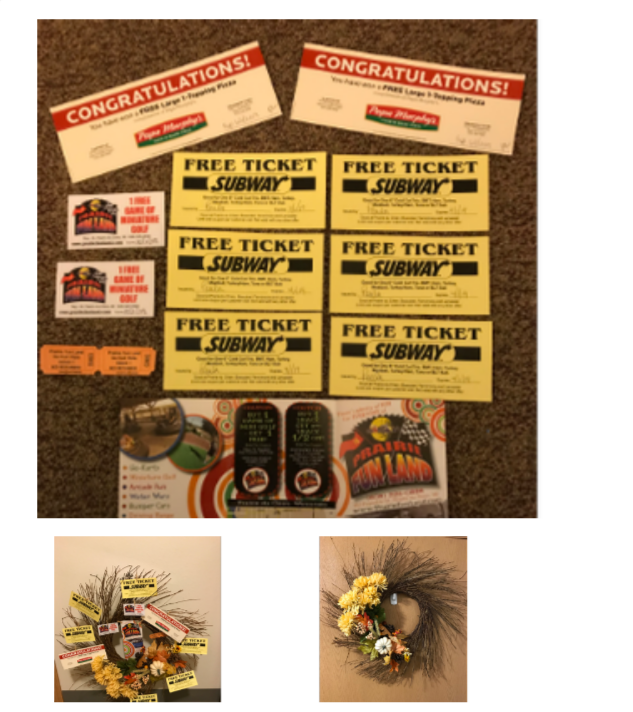 The final drawing will be Sat Jan 5, 7:30 PM. Follies are Friday, Jan 4, 7:30 PM. 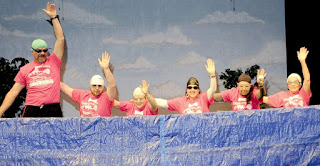 Sat Jan 5 2:00 and 7:30PM. 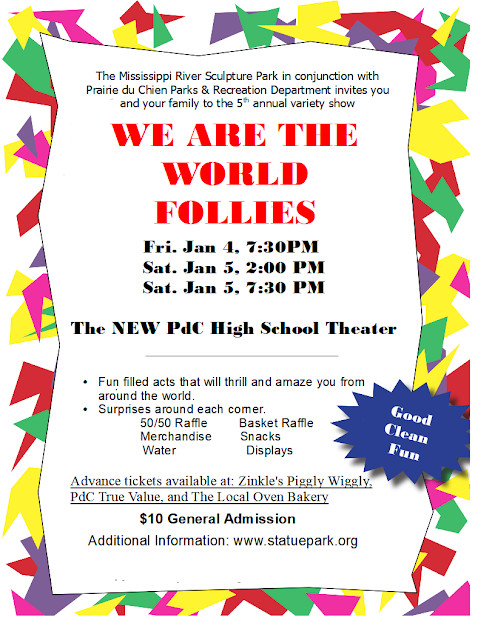 While visiting popular stores in downtown Prairie du Chien you may have come across the table display for “We are the World” Follies for 2019. Through the use of technology, the invitation comes alive though the use of Augmented Reality. Augmented Reality is when the “physical world” and “digital information” are combined, an “augmented reality” is created. This combination is called an “aura”. In this case, the aura is triggered by a sign. The Mississippi River Sculpture Park is the only public park in Prairie du Chien to offer augmented reality. In fact, it just may be the only park of it's kind in the entire Midwest! 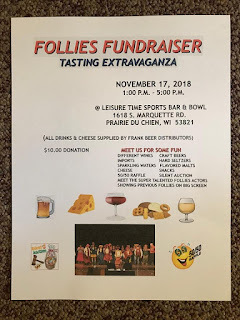 and, now, it is the first ever to present the follies in this format! 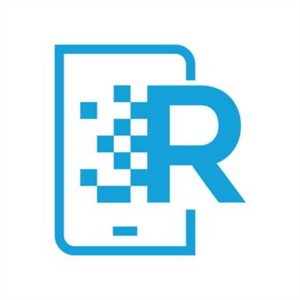 HP Reveal is a free mobile app for any web-enabled device that helps to create an “augmented reality”. Step 3: Point it and watch it come alive. Open HP Reveal on your mobile device. Click the view button at the bottom of the screen. The view button looks like the corners of a square. Aim the HP Reveal viewfinder at the image below. Watch what happens. Does a video Appear? 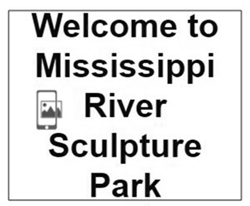 You should be viewing a short video about the Mississippi River Sculpture Park. Go visit the park. Point HP Reveal at each descriptive sign next to the sculpture. Now, point the app on the program display, It’s Alive! Please note: This is not a perfect system. The app is dependent on having an internet connection to work. Additionally, the viewfinder can be finicky. 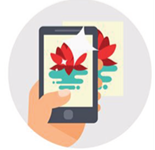 Although we have tried to choose objects that work 100% of the time, a change in lighting or another uncontrollable factor can cause the app to be unable to recognize the image. When the app is not able to recognize the image the overlay will not appear. 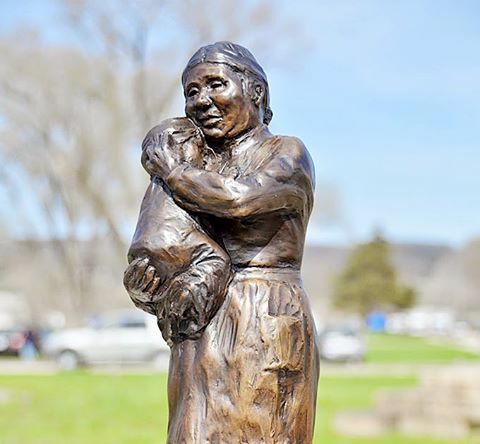 Imagine 25 life-sized, historical figures from Prairie du Chien’s past enshrined in bronze statue form, placed carefully in a spacious park setting along the scenic Mississippi River. Doesn’t that sound enchanting? The Mississippi River Sculpture Park, as it sits in Prairie du Chien today, is the beginning of that exact vision. Currently, there are five statues in the free, self-guided park, at Villa Louis Road and Bolvin Streets. But, to get the full effect of what the sculpture park could be someday, local residents and visitors of all ages and interests are invited to check out a new display that showcases the 20 additional statues planned for the setting in the future. A display cabinet—located in the small, limestone, “Eagles on the River” building as you first access Water Street on the island—presents the 25 total sculptures, as miniature, acrylic replicas, that may, one fine day, be arranged altogether in the park. Igou said the board realizes each of these sculptures is quite expensive, and recently, the members have done research into how they can bring the cost down significantly. Doing so could make the finished park to fruition much sooner too. In the meantime, Igou would really like the public to make a special trip to the Eagles building to view the exhibit. Seeing all 25 of these select figures, who helped shaped the area, together, may truly drive home the essence of the grand potential this one-of-a-kind sculpture park has. She and the board hope this display will provide further inspiration to people to visit the park, walk among the statues, learn their stories and possibly consider donating toward the coming sculpture. At present, the figures in the park include Black Hawk, Dr. William Beaumont, Victorian Lady, Voyageur and Emma Big Bear. The next bronze sculpture, Aunt Marianne LaBuche, was Prairie du Chien’s first physician. She rescued and nursed her granddaughter, baby Louise Gagnier, who had been scalped and left for dead. As of mid-July, $28,000 was yet needed to complete the LaBuche statue. 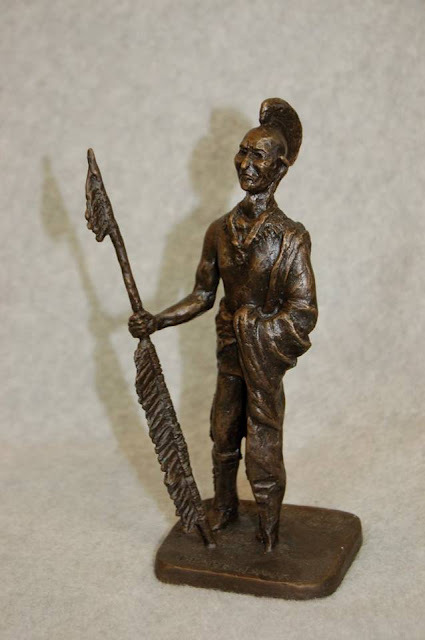 The following 19 intended representations are to include British Redcoat, Chief Shin Ga Wassin, Winneshiek, Chief Waapasha Anishinabeg, Father Jacques Marquette, Father Samuel Mazzuchelli, Jefferson Davis, Judith and Nina Dousman, John Lawler, Louis Joliet, Mastadon Hunter, Riverboat Captain, Mississippian, Mound Builder, Nicholas Perrot, Minnie Owens, Zachary Taylor and Zebulon Montgomery Pike. For more information about the history of each figure, sculptor Florence Bird or to buy an inscribed paving brick or donate, visit statuepark.org. Today, there are five life-sized sculptures: Chief Black Hawk, Dr. William Beumont and son, Israel, a Victorian Lady, a voyager, and Emma Big Bear. Each one intricately sculpted. The final stages of fundraising is being completed for the sixth sculpture: Marianne Labuche. But what would happen if a park visitor focused the camera of their mobile device on each of the sculpture's descriptive sign and, not only saw the sign but superimposed over the sign, the sculpture comes alive and actually talks with you? That’s what augmented reality is! When the “physical world” and “digital information” are combined, an “augmented reality” is created. This combination is called an “aura”. In this case, the aura is triggered by a sign. The Mississippi River Sculpture Park is the only public park in Prairie du Chien to offer augmented reality. In fact, it just may be the only park of it's kind in the entire midwest!